Dortmund/Berlin - Another season, another frontline reshuffle. Last time around, it was Mario Götze Borussia Dortmund needed to replace; going into the 2014/15 campaign, it is a Robert Lewandowski-size hole coach Jürgen Klopp has to plug at the very heart of his attack, with the Polish centre forward following in Götze's footsteps by moving to Munich. Long the German game's worst-kept secret, Lewandowski's end-of-season move to FC Bayern München was confirmed at the start of the year. 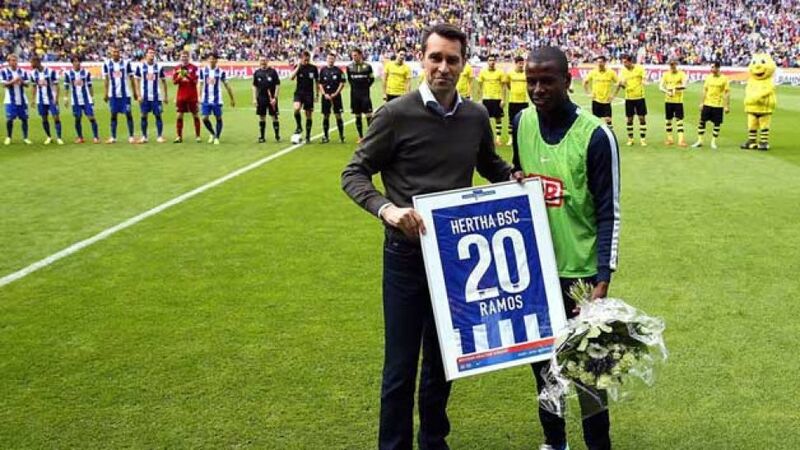 Three months down the line, Klopp and BVB sporting director Michael Zorc had a putative successor already signed up in the form of Hertha Berlin's Adrian Ramos. At that juncture, the Colombian striker was a hot contender for the top scorer's Torjägerkanone, which Lewandowski would ultimately claim for himself on the final matchday - a brace at Hertha, of all places, leaving him on 20 goals for the season, four clear of his counterpart at the other end of the Olympiastadion pitch. Invidious as they may sometimes be, comparisons are as inevitable in football as in any other competitive sphere. The question most frequently posed in this case, hardly surprisingly, has been to just what extent the 28-year-old Ramos, who only really fired himself centre-stage in his fifth and final season with the capital club, can adequately replace a player three years his junior and unquestionably one of the most highly-rated forwards in the European game. It might, however, be more pertinent to ponder whether Dortmund view the new arrival as a direct replacement at all. For one thing, the management intimated at an early stage that further strengthening of the forward department would be in the pipeline, and that has ensued with the recruitment of Dong-Won Ji from FC Augsburg and Ciro Immobile from Torino FC. Just as was the case last season, when faced with the departure of the multifaceted Götze this time last year, BVB responded with the double-whammy signing of box-to-box maestro Henrikh Mkhitaryan and speed merchant supreme Pierre-Emerick Aubameyang. Ramos was the first confirmed new arrival, however, and he looks set to play a specifically defined role in this summer's tactical reshuffle. The Colombian may not possess Lewandowski's sublime level of close control, or his ability to regularly score in the most improbable circumstances, but he can add a fresh edge to Borussia's game in other ways. He is a powerhouse in the air - five of his 16 league goals this season past came by way of a header - and has little hesitation in taking a pot with his weaker left foot, which accounted for a further three of that total. By contrast, just a fifth of Lewandowski's 20 strikes were not sunk by his favoured right foot. Like his Polish predecessor, Ramos has an above-average success rate going past opponents one-on-one and, given Hertha's comparative limitations, he is even more practised in holding the ball up until support arrives. With that support, at Dortmund, coming in the form of messrs Mkhitaryan, Aubameyang, Marco Reus,Jakub Blaszczykowski and others, the new arrival should have every opportunity to improve on this season's tally of six assists. As to topping the 16-goal return with which he bade the capital farewell, in light of the rate at which BVB churn them out, Ramos is likewise looking at the prospect of far more chances coming his way, regardless of who lays them on. He is less certain of matching the 30 starting appearances racked up in the league for Hertha last term but that is secondary to the greater goal at the club "everyone wants to play for”. As far as his coach in Berlin, Jos Luhukay, is concerned, “he earned this. He wanted to be competing for the title and in the Champions League. That's not something we could offer him.” For Luhukay, Ramos is “one of the Bundesliga's outstanding players,” and one who Hertha will be very hard-pressed to replace. Their loss is surely post-Lewandowski Dortmund's gain.